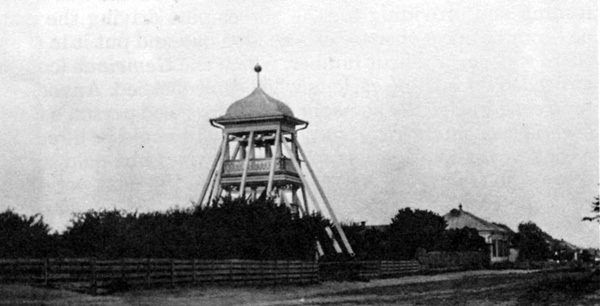 The Freistehender Glockenstuhl (freestanding bell tower) played a very important role in the community and was used to clearly communicate a variety of messages throughout the colony. This type of structure was common in German villages during the 1700's and was adapted for use on the Russian Steppe. The wooden church buildings in Norka were not designed to support the weight and motion of heavy bronze bells within their steeple. As a result, a self-supporting wooden bell tower was built on a lot to the east of the church near the parsonage. The bell tower was stabilized by 10 diagonal braces. Stairs led up to a covered platform. Three different sized bells, each creating a different tone, were hung above the platform and were activated by pulling ropes. Crowning the tower roof was a large globe topped by a cross that was nearly identical, albeit smaller, than the one atop the church steeple. On Sunday mornings, all of the colonists in Norka were summoned to the church by the ringing of the bells, which was performed by three men. First, the smallest bell was rung as a signal that it was time for the villagers to begin walking towards the central square where the church and schoolhouse were located. Fifteen minutes later, the small bell was rung again and its tenor was joined by the baritone of the middle-size bell. More worshipers joined the stream of people walking toward the square. In another 15 minutes, all three bells rang out with the resonant tone of the large bass bell joining the chorus. As the three bells began to ring, the pastor left the front step of his home and the bells continued ringing until he was standing in the pulpit of the church. Those who had gathered at the central square to visit, now filed into the church and took their designated places within the sanctuary. As the bells softened and then ceased, the powerful organ within the church filled the air with its thunderous sound as a prelude to the opening hymn. After the third tolling the streets of Norka were empty. As the congregation rose to recite the Lord's Prayer in unison at the close of the service, the three bells again rang loudly until the pastor returned to his home. This was also a signal to those at home to recite the Lord's Prayer and to ready preparations for the Sunday meal. 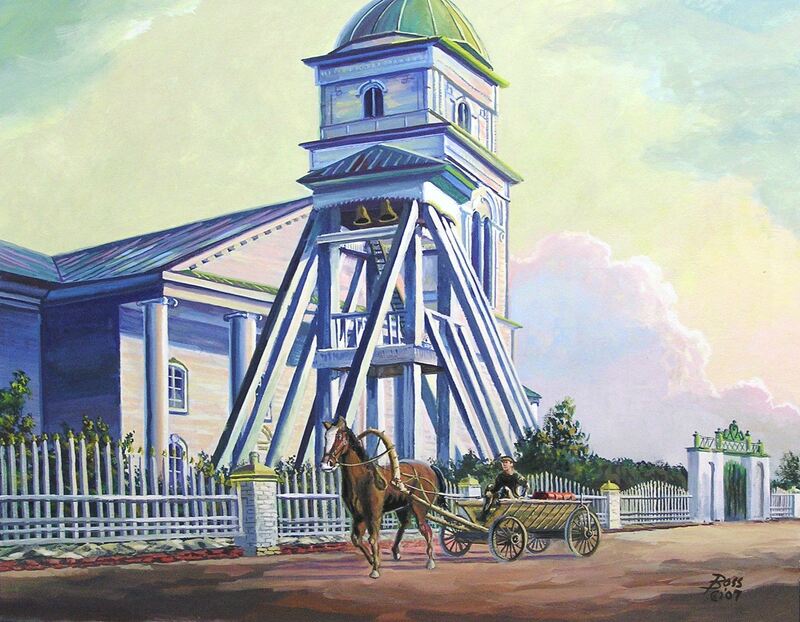 Painting titled "Norka Bell Tower" by Michael Boss. From the collection of Blackwell Properties, LLC, Cincinnati, Ohio. On Sunday evenings, the bells were rung to announce the close of the Sabbath and the beginning of the weekly routine. Every evening at 7 p.m. a bell was rung to indicate that the work day was ended. On Wednesday night, the bells called the people to the Versammlung or prayer meetings. It was customary for the church choir to gather on the bell tower platform the evenings before Easter and Pentecost to sing hymns. On December 31st, the bells rang out the old year and then, at the stroke of midnight, they welcomed the New Year. Church bells also called pupils to school and accompanied the confirmation class and bridal couples to the altar. The bells were rung to announce a death in the village and to call people to a funeral service. A death was announced in various ways through "tolling information." For example, in the colony of Warenburg, if a child died, then the smallest bell was tolled first, then all three were tolled at the same time and finally the smallest bell was tolled a second time. If the person was an unmarried adult, the middle-sized bell was rung first and last. In the case of an adult who was a married member of the congregation, the ringing started with the largest bell. In the colony of Messer on the other hand, the small bell was tolled three times with a pause between each tolling and finally all three bells were tolled together. If a young unmarried person died, the large bell was tolled first and, after a short break, this was followed by the small one and then lastly all three were tolled together. If an older unmarried person died, then the large bell tolled first, then the small one, the large one again and then all three were tolled together. In the case of a married or an elderly person, the large bell was tolled three times and lastly all three were tolled together. The tolling information for Norka is not known. The bells were rung as soon as possible to warn of a fire, a feared and ever present threat in the colony. During very inclement weather, such as blizzards, the bells were rung steadily for hours to provide a directional signal that would lead those who might be lost out on the wide open steppe back to the safety of the colony. "Wherever one is standing or walking, when a bell is rung one removes one’s hat or cap and prays a silent prayer. Church bells guide fellow members of the community home when they are outside and late coming home during snowstorms. Church bells call the inhabitants of a village to action when a fire which is causing damage has broken out. It is preferred that the pastor comes in order to inspect a fire. Actually one does not expect him to participate by working hard to put it out. He is only supposed to go around the spot where the fire is burning three times. One believes that when he does this the fire will be contained within the borders of that area. Church bells invite the congregation to a prayer service in the House of God before field work begins. No one goes out to work before this worship service. It is held either on the evening before the day on which all farmers and their workers drive out to the fields or on that same morning. After the service and at the same time all the farmers and their co-workers leave the village to go to the fields as a group. Patriarchs remain standing with bared heads and folded hands at their gates and pray for God’s blessing upon the work which is about to begin. If the heavens lock their gates for too long, and it does not rain and people become anxious because they are concerned about their future daily sustenance then church bells call the congregation to worship once again and a prayer service for rain is held either in church or out on a field. On Saturday evenings during Abmachzeit (harvest time), wagons are driven home from the steppe in order to pick up one week’s supply of foodstuffs. This is because driving is not permitted on Sundays. And so everything is prepared, loaded on the wagon, the horses are harnessed and then one waits until the bells ring the evening. The gate is opened, the wagons all move ahead at the same time and once again the patriarchs stand in front of their gates with bared heads and support those who quickly pass by with their presence. They pray for strength for the workers on the steppe and also for their health. No wonder that the sound of the church bells from a native village are so dear to and cherished by a Volga German. When sons and daughters of the Volga who have emigrated or migrated from the region do not hear church bells they often become homesick." Bauer, Reuben Alexander. One of Many. Edmonton, Alta. : 1965. p. 33 Print. Koch, Fred C. The Volga Germans: In Russia and the Americas, from 1763 to the Present. University Park: Pennsylvania State UP, 1977. p. 129. Print. Olson, Marie Miller., and Anna Miller. Reisbick. Norka, a German Village in Russia. Denver: S.n., 1981. p. 25. Print. Journal of the American Historical Society of Germans from Russia, Vol. 8, No. 2 (Summer 1985), page 12. <https://c.ymcdn.com/sites/www.ahsgr.org/resource/resmgr/1980s_Journals/Journal%2c_Vol._08%2c_No.__2_%28Su.pdf>.